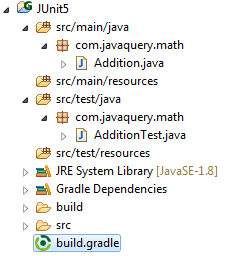 Follow the given step to setup JUnit 5 in Gradle project. Newbies wanna read Setup first gradle project in eclipse. Step 1.1. Attach JUnit 5 gradle plugin to project. Step 1.2. Add JUnit 5 dependencies. Step 1.3. JUnit 5 configuration. This is how your build.gradle file will look like after following the above steps. Refresh Gradle project so it'll download required libraries. Create test source folder parallel to main source folder (i.e src/test/java and src/test/resources). Follow the image. Step 4. Create first unit test. * Add given number 'a' and 'b'. I created two test cases. Out of two case one is success and other is fail. Perform clean and test task on your gradle project.